The Tamale Lady (Virginia Ramos) is a San Francisco icon. She sells delicious homemade tamales to drunk patrons all over the city, but is a particular institution at a rowdy and crowded bar called Zeitgeist, where she's doled out munchies and advice to customers for over 20 years. Now, Zeitgeist claims the city has forced the bar to kick Ramos out because she's an "illegal vendor." San Franciscans are pissed: they'll grudgingly allow Mark Zuckerberg to move to the Mission, but they won't allow anyone to take away their goddamned tamales. So when Zeitgeist announced via Facebook that the Tamale Lady had to go — "We are sad to announce that the Tamale Lady may no longer sell her tamales at Zeitgeist. This is forced on us by SF city codes and regulations." — the city freaked out. Why was this happening? Why the Tamale Lady and not all those bacon-wrapped hot dog vendors? Why the Tamale Lady and not one of the zillion copycat food trucks that sell $14 pulled pork sandwiches? WHY? A Zeitgeist employee told SFist that the health department issued an order for Ramos to stop selling her wares because she doesn't have a permit, but Mission supervisor David Campos told the San Francisco Bay Guardian that the city's intention isn't to attack beloved vendors. "There's kind of a dead zone when it comes to smalltime street food vendors and pop-ups, unlike with food trucks and and brick-and-mortar restaurants," Campos rep Nate Allbee said. "...We want to craft legislation that will make it clearer how to protect these vendors while assuring the public." "The Tamale Lady is not going down," Campos said. "We're working hard right now to find options to make sure she stays in business." "I come in from Mexico, I never go to school because I have to work for my kids, I got seven kids, I learn English, I write a little bit (you can see my twitters they're really bad)," she tells SFist. "But if you kids can help me, let me know. Maybe something on the Internet, so I can go sell tamales from the offices ... then later when I've got more money then I can start my own little place." 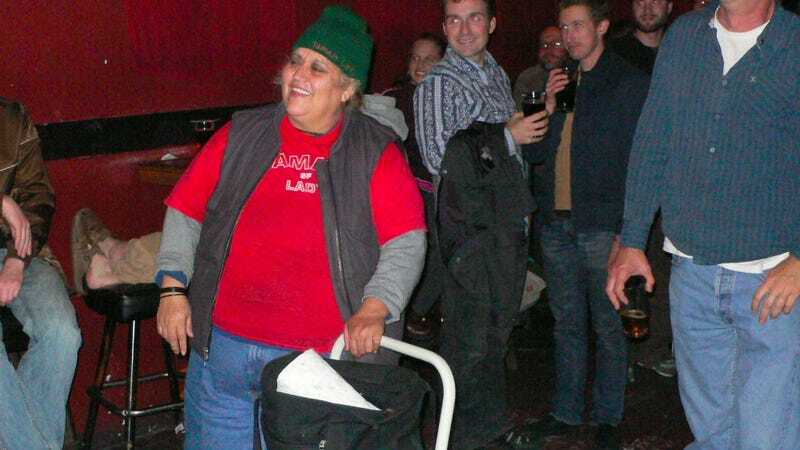 In the meantime, San Franciscans can support (and party with) Ramos at her 60th birthday party at the Eagle Tavern on June 21st. Long Live the Tamale Lady!